The glowing Hokkaido pumpkin is back in my kitchen! Although I’ve spotted the bright orange fruit at the markets for quite a while, I wanted to wait a little before it became a permanent part of my weekly purchases again. I know that as soon as it’s on my kitchen tops, nothing can stop me and I use it for everything, quite excessively, soups, risottos, pasta and breads, spreads, salads, cakes, the whole range from sweet to savory. 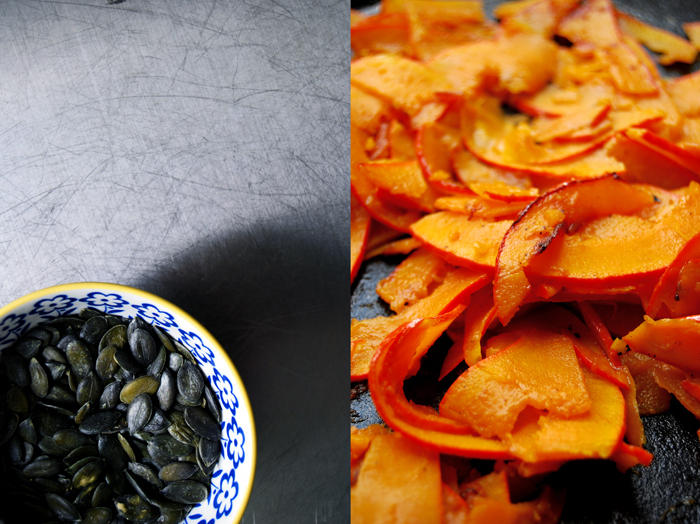 One of my favourite pumpkin meals is oven roasted wedges coated in spiced olive oil and herbs. I could eat that every week! 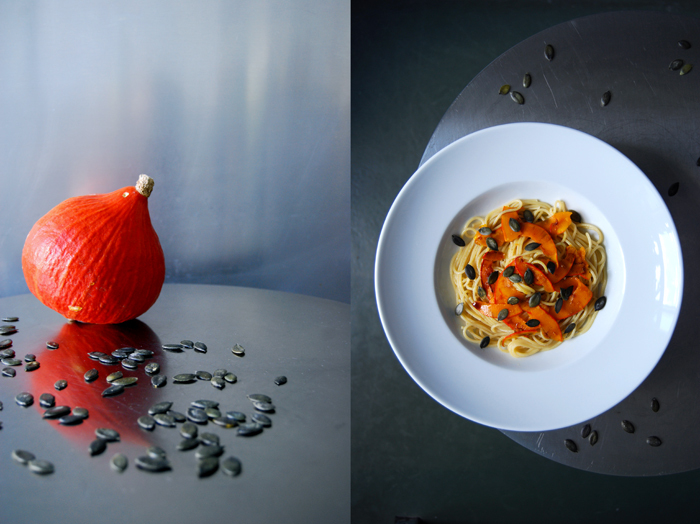 For now, I will start with a pasta dish and for this recipe I use all a pumpkin offers, the flesh and skin, its seeds and fragrant oil. 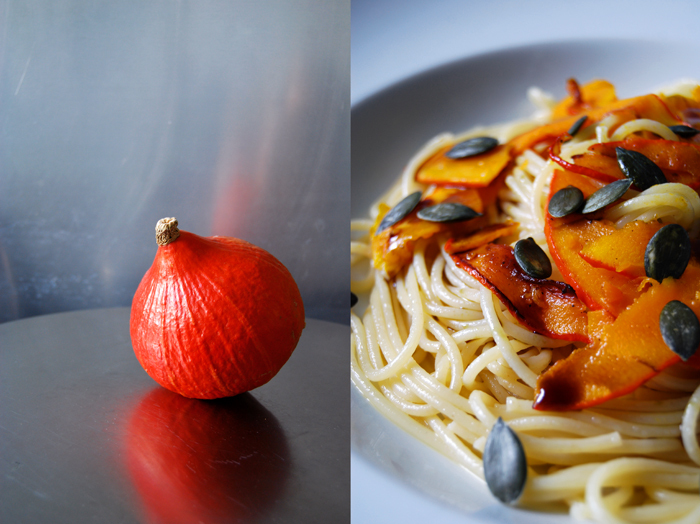 I mix my shiny spaghetti with a little bit of the water I used to cook the pasta in before I stir in very thin pumpkin slices pan roasted for just a few minutes to soften them and sweeten their taste. 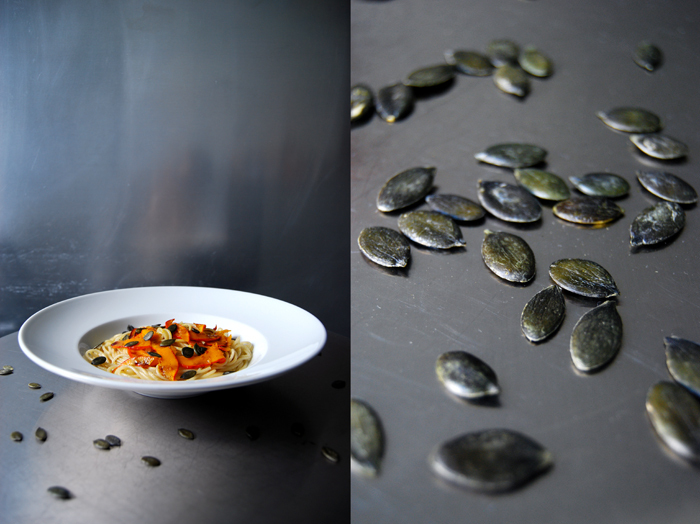 I sprinkle the pasta on each plate with a bit more than a tablespoon of pumpkin seed oil and a teaspoon of the fruit’s crunchy roasted seeds. This dish is an ode to the most delicate of all pumpkins, a true Hokkaido feast! It makes the pasta so smooth, almost velvety in texture and sweet and nutty in taste. 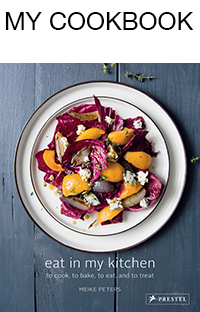 Each plate looks like the late afternoon sunlight that lights up my kitchen between late summer and early autumn, golden and warm! This recipe has been featured on Food52 Halfway To Dinner! Keep the plates for the pasta in a warm place for a few minutes (80°C / 175°F in the oven) before serving. Cook the pasta in lots of salted water al dente. Keep some of the water used to cook the pasta. Drain the spaghetti and mix with a splash of the water they cooked in. Cut the pumpkin with a cheese or vegetable slicer into very thin slices. In a large heavy pan, heat the butter and a splash of olive oil, add the sugar and pumpkin and roast for a few minutes on medium heat, stirring constantly, until the slices are golden brown on both sides and soft enough to break with a fork. Season with salt and pepper. 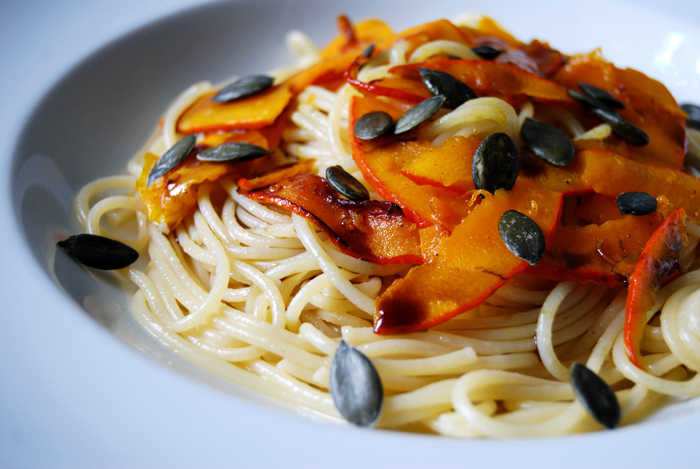 Divide the pasta and pumpkin slices between the plates, sprinkle each plate with 1 1/2 tablespoons of pumpkin seed oil, a teaspoon of pumpkin seeds and season with salt and pepper to taste. Intrigued by the recipe. Live in Austria where pumpkin seed oil is a big thing. But a question. How do you keep the spaghetti white? Pumpkin seed oil turns everything a kind of green color. I tried roasting Hokkaido pumpkin, and it turned out beautifully except that it was bitter when I actually tasted it, why is that? Could it be that the pumpkin is too old? Maybe the temperature was too high? The Hokkaido should be golden and soft but not too dark (or burned), that would make it bitter. If it’s an old pumpkin it will need a little bit longer to soften, I would keep it on lower heat in that case. What a beautiful dish. Love the contrast between the dark seeds and the bright orange pumpkin!